Capirotada (Spanish pronunciation: [kapiɾoˈtaða]), formally known as "Capirotada de vigilia", is a traditional Mexican food similar to a bread pudding that is usually eaten during the Lenten period (comida de cuaresma). It is one of the dishes served on Good Friday. There are various preparations of the dish. It is generally composed of toasted bolillo (which is like the French baguette) and soaked in a mulled syrup made of the following: whole cane sugar, which is known as piloncillo; clove; and cinnamon sticks. Some of the typical ingredients include nuts, seeds, and dried (and sometimes fresh) fruits, among these are: apples, dates, raisins, apricots, peanuts, pecans, almonds, pine nuts and walnuts. In addition, aged cheese is added, which might explain why some people's recipes call for milk. Many capirotada recipes do not include any meat. Other recipes include meat as a layer. The ingredients are largely the same as those used during the 1640s to make breads and cakes. These ingredients and recipes have been recorded by the Holy Office of the Inquisition and saved to this day in the archives. 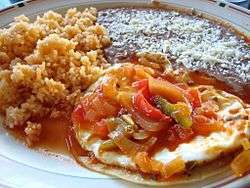 The basic ingredients carry a rich symbolism to the Passion of Christ, and the dish is considered by many Mexican and Mexican-American families as a reminder of the suffering of Christ on Good Friday. The bread represents the Body of Christ, the syrup is his blood, the cloves are the nails of the cross, and the whole cinnamon sticks are the wood of the cross. The melted cheese stands for the Holy Shroud. "Capirotada recipes". The Houston Chronicle. Feb 4, 2008.